Summer is the time for grilling, swimming, playing outside and of course, vacations! I You may not be going on a trip, but you may have kids home from school or other activities that will keep you busy, and perhaps not focused on your financial goals. You may have started the year off with the goal to get your finances back on track. Then life got busy and your goals fell by the wayside. If that describes you, don’t give up on your goal. I know it may feel like you can’t make any progress or that you don’t know where to start. If you want to get your finances back on track this summer, you simply need to take a step in the right direction. Here are some ways to get your finances on track this summer and hit your goals this year. Are you currently saving for retirement or does it seem so far off that you think starting now won’t make a difference? Don’t believe that lie. You can invest with little money now. You just need to start. There are many online brokerages out there that simplify investing for you. Ally Invest is an example. Ally Invest offers trades as low as $3.95 (the lowest in the industry) and has a variety of free tools to help you get on the right track with your investing. We hear a lot about side hustles. It’s for good reason as they can be a great way to bring in additional income. The side hustle my wife started eight years ago has turned into a business and we’ve more than replaced our income as a result. Drive for Lyft. The ridesharing industry is a great way to make extra money to pay off student loans. If you’re at least 21 years old, have a valid driver’s license, have a newer car, and can pass a background check you can drive for Lyft. They also offer a $250 sign on bonus! There are many ways to bring in additional income. Here are 51 ways to make extra money you can start today. When was the last time you checked in on your 401(k)? 401(k) plans are great but it’s also easy to miss out on opportunities to cut down fees or find a better performing fund that’s more in line with your goals. Blooom is a great resource to check up on the investments in your 401(k). Blooom analyzes the investments in your 401(k) and looks for lower cost alternatives so you’re not wasting money that otherwise could be working for you. How much time do you spend watching TV each day? Do you have a long commute on public transportation? Did you know you can use that time to make extra money? The best way to do this is through online surveys. There are many legit survey companies that let you make money while watching TV or sitting at the doctor’s office. Global Test Market: Global TestMarket lets you make money for testing products and also asks for feedback on products you already use around your home. Global TestMarket has paid out over $30 million in earnings since 2016. You can redeem earnings as cash to PayPal or as gift cards. A savings account is the best way to start saving, especially when you set up automatic transfers to it on a regular basis. If you don’t have a savings account, consider opening one to get back on track this summer. CIT Bank is a great option. CIT Bank pays 1.55 percent on your savings (22x the national average), or 1.85 percent if you open a Money Market account. Both have a minimum balance requirement of just $100. Side hustles are a great way to make money. However, you shouldn’t overlook the opportunity staring you in the face – and that’s at your day job. Can you volunteer for overtime? Can you take on additional duties? Not only can that be a great way to bring in more money, but you can also grow professionally. Many struggle to save for long-term needs, or simply save for a long period of time. Instead, make a goal to save a certain amount of money each week or month this summer. Use the momentum to build your savings and bonus points for challenging yourself to save even more – the goal, after all, is to change your behavior towards saving. Do you still have cable? If so, you’re overlooking a huge savings opportunity! The average cable bill is $110 per month and I regularly speak with people who spend $150+ per month. We canceled DirecTV over two years ago and now save $90 per month. You can cut cable and still get all the shows you want, plus save $50+ per month. You will need a streaming option to do this. DirecTV Now and Hulu Live are among the best providers, both offering plans under $40 per month. Both offer 7-day free trials to try them out. How much is your monthly cell phone bill? If it’s more than $30 or $40 then you’re overpaying. Just like with cord-cutting, there’s no longer a need to pay a big phone company $100+ per month for your needs. Republic Wireless is a great option for a discount cell provider. They operate on the Sprint network and offer unlimited talk and text plans that start at $15 per month. If you want data, they charge $5 per GB per month. Saving money most commonly involves looking at how we are spending our money. Sometimes, however, it literally pays to take a look at how you compare to others when it comes to finances. It’s not as difficult as it might seem thanks to Status Money, an app created by two data scientists. By comparing your information to others, you can see if your feelings about overpaying for something is accurate, not to mention other financial concerns. You can do this across a broad group, or focus it even more by creating custom groups. I’m not a big fan of no spend months but I believe it’s possible to go without a non-essential item for one month. That one thing will be different for everyone and that’s ok. Find one thing that’s a luxury and see if you can go without it for one month. You may find the value is worth the cost, but you also may find a new money-saving opportunity. How many memberships or subscriptions do you use each month? Do you have any that you don’t use? If so, that’s wasted money you can easily reclaim with little effort. I know calling to cancel subscriptions can be a hassle. It takes time and you may overlook a subscription or two. Trim helps you by canceling old subscriptions for you. Trim is a free to use app that connects to your bank account to analyze your spending. It identifies subscriptions and memberships and cancels the ones you no longer use. Trim also works to negotiate bills on your behalf so you can keep more money in your pocket. How much is your mortgage payment? Have you taken advantage of the low rates to refinance and lower your payment? If not, you’re overlooking a simple way to save money. Rates are going up, but they’re still low, historically speaking. Check your rate at LendingTree to see how much you can lower your mortgage interest rate. You can compare up to five lenders and have results within minutes. If you have credit card debt you know just how suffocating the interest can be. The average APR on a variable rate card is almost 16 percent – and many are significantly higher than that. Assuming you’ve cut the behavior that led to the credit card debt in the first place, you can save a good chunk of money by consolidating your outstanding balances into a lower rate loan. Avant and LightStream are good options to lower your interest rate. With either, you can cut 10 percent or more and pay off your debt quicker. I’m not talking about the “B” word here. Budgets may not work for everyone, and that’s fine. However, there is immense power in tracking your spending as it shows you where your money goes each month. You can simply write down each expense, use Excel, or use an app to track your spending. Tracking your spending sounds difficult, but it’s pretty simple, especially with an app that automates everything for you. Tiller is a great service to track your expenses. The service connects to your bank and other financial accounts and automatically pulls all of your transactions and puts them in a Google Sheet. This lets you go through your spending and find potential savings opportunities. Did you recently graduate with student loans, or have you been paying on them for several years? You know how staggering the debt can be and feel like you’ll never be free of the loans. The best way to pay them off quicker is to consolidate or refinance the loans. Credible is the best option to use to compare multiple lenders. Credible lets you check rates with up to seven lenders at once, allowing you to get results within a few minutes – with rates as low as 2.54 percent on variable loans and 3.74 percent on fixed loans. The average person who uses Credible saves nearly $19,000 on their loans. Does having a credit card in your wallet tempt you to spend money you don’t have? There’s a simple solution – leave the credit card at home and stop racking up debt. Think of this as the precursor to consolidating your credit card or student loan debt. Sit down and list out all of your debts, the interest rates, balances and minimum monthly payments to see where you stand financially. This allows you to know what you’re up against and form an effective plan of attack. How much do you spend at the grocery store each week? Did you know you can get cash back on that shopping? I’m not talking about clipping coupons, but actually getting cash back for what you buy. With the Ibotta app you can get money back on all your shopping. The Ibotta app shows you offers based on your location and the store you’re shopping at. Do your shopping, buying the offers you selected and scan your receipt to get your savings. Ibotta also works at over 300 online retailers so it doesn’t just work on groceries. The best part of using Ibotta? They have a redemption minimum of just $20 (payable via PayPal or Venmo) and they give you $10 just for claiming your first offer! I hate food waste. We average over $500 in food waste per person, per year. That’s literally like throwing cash in the trashcan. A simple way to lower this is to start meal planning so you can shop wiser at the store. A service like $5 Meal Plan can help you come up with meal plans that everyone in your family will like and also help cut down on food waste. This is a no-brainer and a great way to save money. In many instances generic is quite a bit cheaper and of similar quality. Find what you like that’s generic and put the savings towards something else in your budget. Eating out is fun, but it can get expensive. The average family spends at least $225 per month eating out at restaurants. That may seem like nothing, but taken over a year it comes out to $2,700 – that’s nearly half of the amount needed to max out a Roth IRA. Find a way to cut that in half, or more, and put that money to work for you, not against you. How much stuff do you have lying around the house that you don’t use? Why sit on those items when you can turn them into cash? This is especially the case if you have items like old cell phones, games, movies and more. Gazelle is one great option to sell those items. You scan the barcode on their site and they tell you how much it’s worth. If you accept the offer, they send you a shipping label and once they receive the item you get paid. Have Apple products? Check out BuyBack Boss as a good alternative. Are you currently paying off debt? Make yourself something visual to have around the house to keep you on track. I did something similar when I was paying off debt and it helped me when I wanted to give up. Start with the amount you currently have and draw a progress bar going to $0. Each time you throw more money at the debt fill it in. I found this was a great way to keep me motivated to continue attacking the debt. I’m not very good with my hands, but I learned one thing quickly when we became homeowners – it’s expensive to hire someone to fix something for you. With the abundance of tutorials online you can do many things around the house and save a chunk of money in the process. I mean, really, do you want to pay someone $200 to fix something that requires a $10 part? There are many other ways to get your finances back on track this summer. Find a few that you can do. Don’t give up because you think they won’t do anything for your finances. Each step you take will help you reach your goal of better managing your money. What are some other ways to get your finances back on track this summer? What’s a new way you’ve found to save money recently? Do you assign savings from certain items to specific goals? 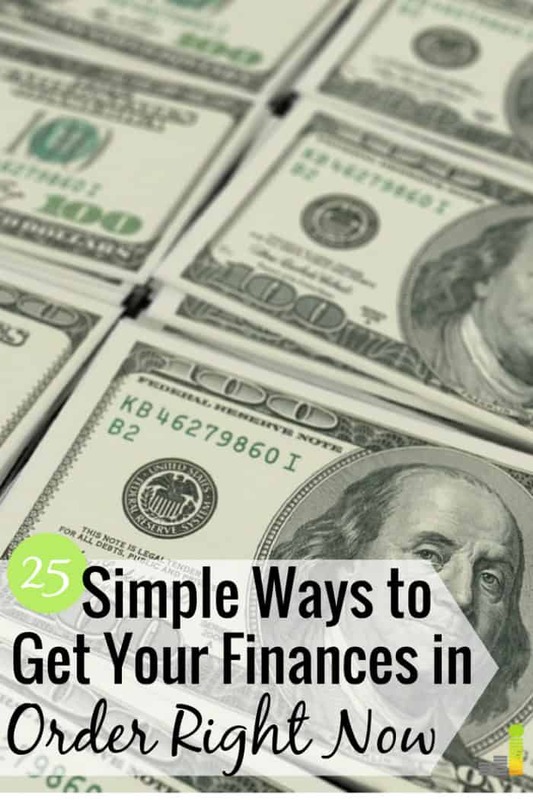 The post 25 Ways to Get Your Finances Back on Track This Summer appeared first on Frugal Rules.